Please join us on this fun ride. From Adamec Harley-Davidson, you will ride to the Riding into History Motorcycle Concours d’Elegance at the beautiful World Golf Village. A Great Ride, Admission into the Concours d’Elegance and VIP Parking. 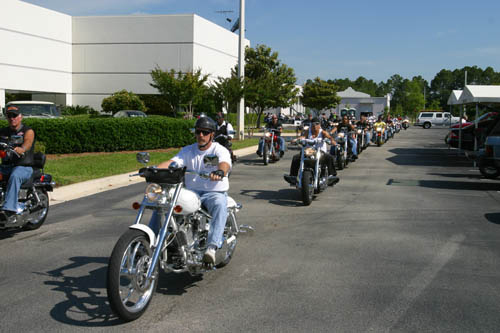 Support K-9s For Warriors while enjoying one of Florida’s premier motorcycle events. When: Saturday, May 11, 2019. Pre-Registration 8:30 AM. Ride leaves at 10:00 AM. Get there early to see all the new motorcycles & enjoy the hospitality of Adamec Harley-Davidson. How Much: Your $20 donation includes: Volunteer guided 1 hour ride to the World Golf Village, Free Admission into the Riding Into History Concours d’Elegance and VIP parking at the World Golf Village, Your donation goes to to K9s For Warriors. Your passenger gets all of the above for an additional $5 donation! Net proceeds from the ride will go to K9s For Warriors. This year’s Concours will feature “A Fast Blast from the Past” Celebration of Competition Motorcycles. There will be 300 + antique, vintage and special interest motorcycles from all over America, plus food, exhibitors, dealers and clubs. The number of riders will be limited, so pre-registration is preferred. To save time register online on the form below. This is a rain or shine ride.